Pies and Pastries – Get Cooking! I’m a pie fanatic. They’re deliciousness that comes with a side of nostalgia and comfort. I honestly just think of pies as the perfect dessert. When I had to give up gluten (health reasons), my pie-obsessed heart was broken. 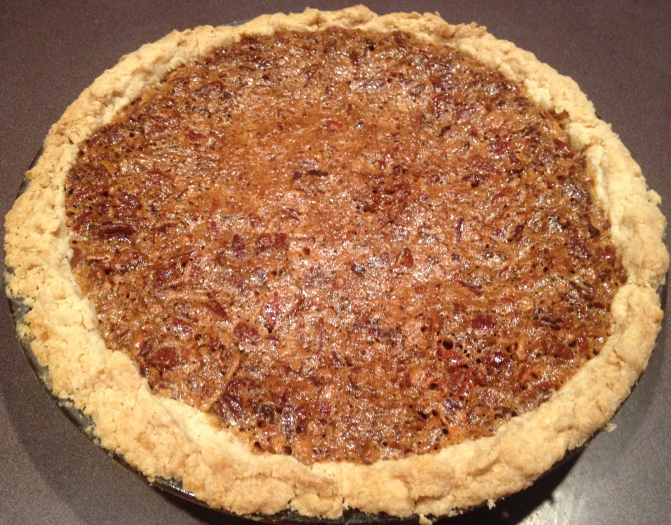 I honestly felt my pie days were over – both baking and eating. Fortunately there are a couple of excellent gluten free pie crust flour blends on the market. Bob’s Red Mill and Glutino BOTH have excellent gluten free pie crust flour blends and I swear by them. Each one is perfectly wonderful and I’m unable to tell much of a difference between the two. I use them interchangeably. With electric mixer, beat the eggs in a large bowl until fluffy. Stir in dark corn syrup, sugar, melted butter, vanilla, and salt. Add pecans to the mixture and stir well. Cover edges loosely with aluminum foil or Pie Crust Shield . Bake at 350 degrees for 20 minutes. Remove pie crust shield or foil and bake 20 minutes longer. A quick word about frozen gluten free pie crusts – DON’T DO IT! I’ve tested a few brands, just to see how they’d turn out. I wasn’t just “unhappy” with the results, I was perfectly mortified. Don’t use one for Christmas, whatever you do. You’ll be gravely disappointed. Spend a little extra time and the results will blow you away. Yahoo Food has launched something they’ve brilliantly named “The Tipline.” The Tipline is a video series which offers up great tricks, easy tips, and fun hacks to help you be on your A Game this Thanksgiving – not to mention Christmas, Hanukkah, New Year’s and all the other holidays and reasons to celebrate. After all, as any good foodie knows, it’s all about the food. To kickstart the series, Senior Editor Stephanie Smith provides us with three easy (as well as beautiful and delicious) ways to improve a store bought pie for Thanksgiving that is sure to these desserts to the next level. Most delis have great pies, but before you serve a particular store’s pie for a special day, test it out for yourself. Just because Store X makes great doughnuts doesn’t mean they necessarily know their way around a pumpkin pie. If the tin pan bothers you, sit it inside a towel-lined glass dish. Use a colorful, festive towel and no one will be the wiser – as long as you don’t have Nosy Parkers around while you’re slicing! If, like me, you actually love making your own pie crusts and pies. However, if you’re like me, you are also human… on most days…. so mistakes happen. 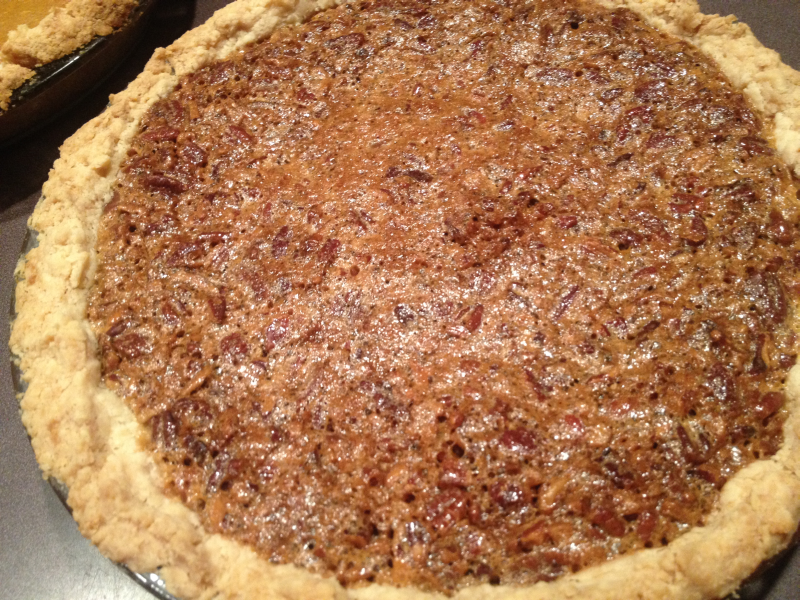 On Thanksgiving it’s a brilliant idea to have at least one deli pumpkin or pecan pie on hand. You know… just in case. Another wonderful video (and talk about timely) from Yahoo Food is How to Make Delicious Gluten Free Stuffing. I can’t wait to try this one out. If time is of the utmost importance (and when is it not? ), you’ll also like 10 Microwave Hacks to Help with Thanksgiving Dinner! Click through for more great food videos and recipes. Crazy About Pies by Krystina Castella: A Collection of Pie Recipes Like None Other! 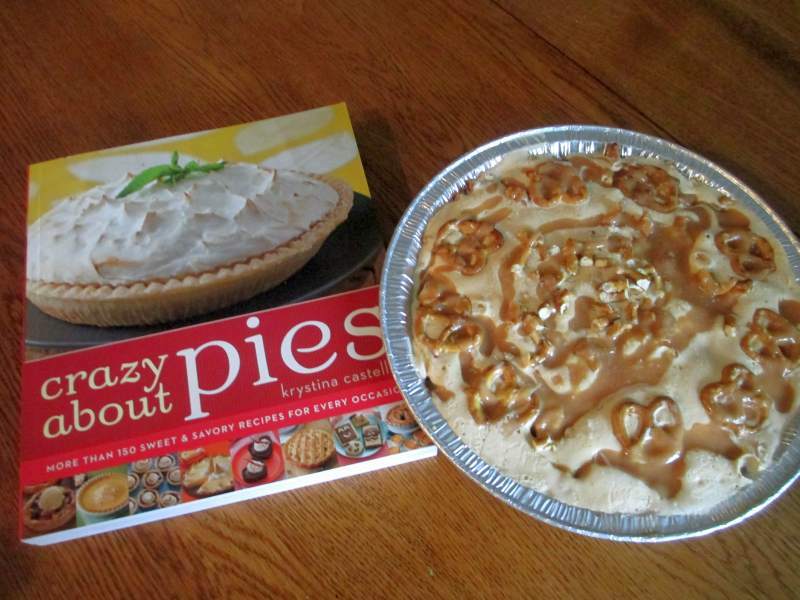 The most recent cookbook I was sent to review was Crazy About Pies by Krystina Castella. Being a pie fanatic, I tore into this cookbook the minute it arrived. The first thing I noticed was all the gorgeous, high quality pictures included throughout Crazy About Pies. While I love (and even collect) ALL cookbooks, I have a special place in my heart for cookbooks with beautiful, colorful pictures. Choosing which pie I wanted to make first was a toughie. The author has managed to round up the most incredible pies in the world for one essential pie recipe collection. This list is just to whet your appetite, there are countless other pie recipes, crust recipes, and filling recipes. There’s also a wealth of information every true pie lover must have at his or her disposal. From making the perfect pie crust to decorating tips – with a slew of other tips and helpful advice in between. Crazy About Pies isn’t just a pie recipe collection – it’s an education in making perfect pies. Pies 101, if you will. As I said, above, one of the first things that made me fall in love with this cookbook was the beautiful pictures. Another thing I love about Crazy About Pies is the fact that includes “special occasion” recipes and “holiday recipes.” I’m ALL ABOUT holidays and special occasions, so when cookbooks include recipes and ideas to make these special days even more special, I get giddy. This cookbook includes pie recipes for Christmas, Weddings, Valentine’s Day, Showers, summer events, Fourth of July, Easter, Halloween, Jewish holidays, and Thanksgiving/Autumn. Basically, Crazy About Pies has everything I love and nothing I don’t. If you love pies, I promise you one thing: You will be wild about Crazy About Pies! Whether you’re just learning to make crusts and pies or you’ve been making pies for more years than you care to count, this simply must be the next cookbook you buy. You can find Crazy About Pies on Amazon (simply click the link). However, due to the awesomeness of the cookbook (and stellar reputation of the author), the quantities are dwindling fast! I’d head over to Amazon right away and grab one if I were you. Amazon always replenishes their stock quickly, so don’t sweat it if the quantities actually run out – simply check back on it in a day or two. If Amazon DOES run out and you don’t want to wait another minute, you can also find Crazy About Pies here. Photo Above: The pie shown in the photo at the top is the first pie I made from the cookbook. 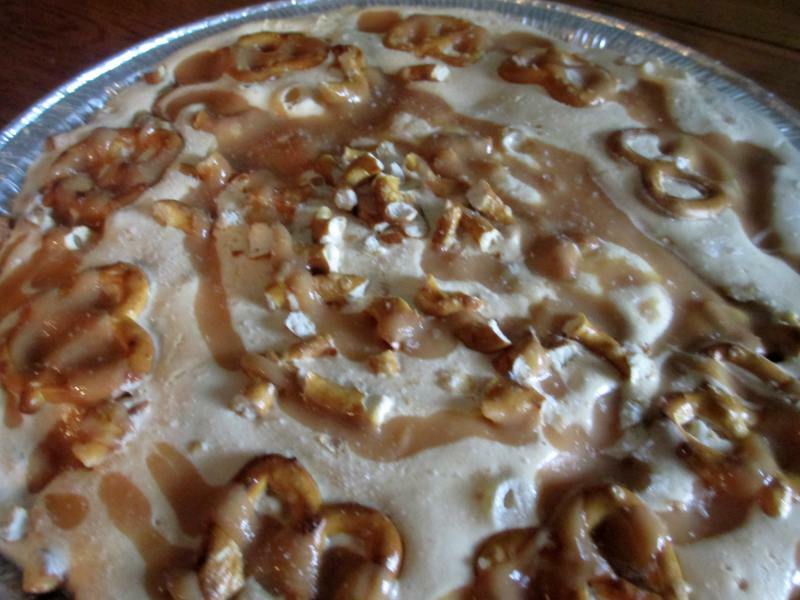 It’s the Salted Caramel Ice Cream Pie (with a Pretzel Crust). Click the link for the recipe! The following pumpkin pie recipe is from one of my favorite (and most used) cookbooks – Cooking With the Horse & Buggy People . Is that a great title or what? 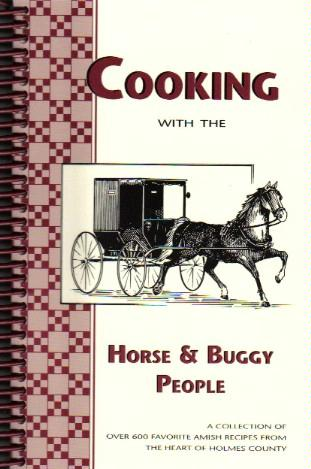 Honestly, I adore this spiral bound collection of Amish recipes. It’s available on Amazon for next to nothing and, believe me, you’ll use it throughout the year MANY, MANY times! Beat egg whites and set aside. Beat egg yolks and brown sugar together until light in color. Add the white sugar, followed by the rest of the ingredients. Fold in egg whites last. Bake at 425 degrees until brown, then at 325 degrees for 45 minutes or done. Click through the link above or the image for more information about the Amish cookbook – over 600 Amish recipes! I have a few reliable favorites that I always list. I was recently sent a wonderful cookbook to review and it hasn’t just joined the list, it has redefined the list. 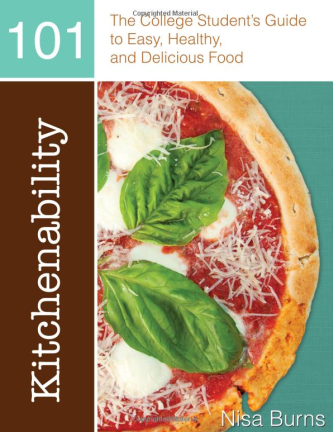 Kitchenability 101 , by Nisa Burns, is packed with fun, easy, creative, and delicious recipes. Ideal for new cooks (such as college students, new brides and grooms, etc. ), the entire first chapter is an introduction to cooking, cooking terms, techniques, herbs and spices, kitchen tools and appliances and more. Kitchenability 101 includes recipes that new (and even not so new) cooks will use again and again. 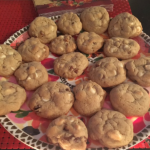 A few of these recipes are listed below! These recipes will allow the new cook to impress (and feed!) his/her family and friends. Their confidence will soar with each successful creation, and as we seasoned cooks know, confidence is one of the most important elements of being a good cook. 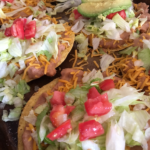 My daughters never went “away” to college (thank goodness… I’m not sure this mother hen would have survived), but if they HAD, a couple of things I would have worried about were that they were eating good, healthy food (as opposed to existing on greasy fast food) AND that they were making good friends. This type of cookbook would have addressed each one of those concerns. I’d have known they were fixing great meals for themselves and could have rested assured that many, many kids would have flocked to their table! College students may miss home-cooked meals, fear the Freshman 15, or feel sluggish from eating too many instant or fast food meals. Or they may want to cook for themselves, but dont know how. In this book, Nisa provides the confidence and motivation for college students to expand their abilities, so they can cook for themselves and their friends. It offers shopping plans, supply lists, budgeting, skills and recipes for cooking in college spaces including dorm rooms, apartments and houses.Includes 10 QR codes linked to instructional videos. 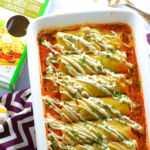 While Kitchenability 101 is geared toward (and ideal for) college students and even new cooks, I have to tell you this: I love this cookbook AND I use it frequently – so don’t think you have to be a newbie to love this cookbook. 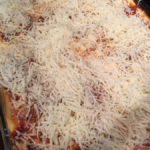 Below is one of my favorite recipes from Kitchenability 101 . 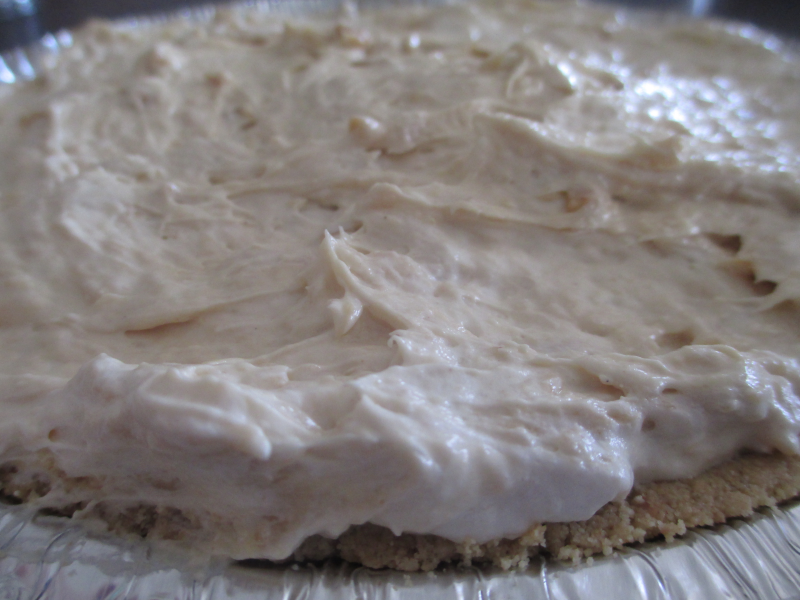 It’s called Nana’s Peanut Butter Pie and it has become my favorite Peanut Butter Pie recipe of all time. It’s a total can’t miss winner. The recipe calls for a 9 oz. container of whipped topping, but the small containers of whipped topping in my area are all 8 oz. I used that and the results were beyond perfect. 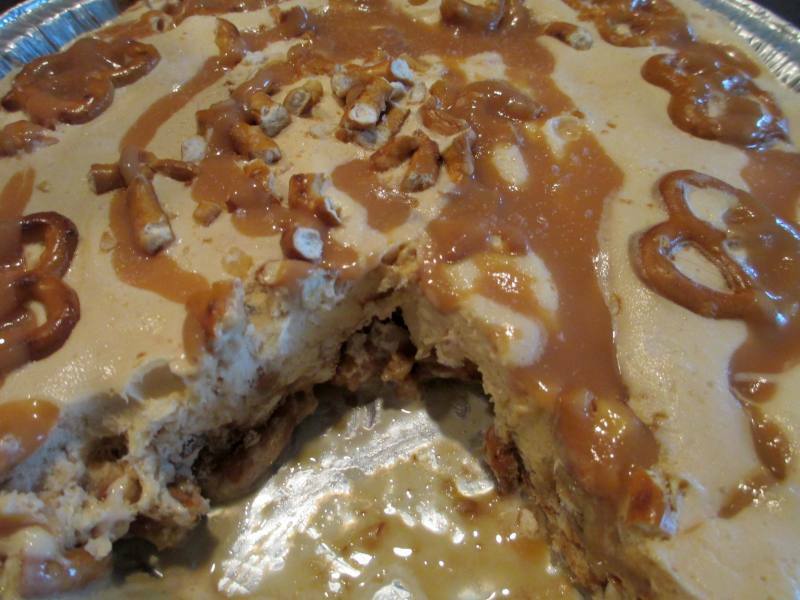 Quick & Easy Peanut Butter Pie and the best I’ve ever had! 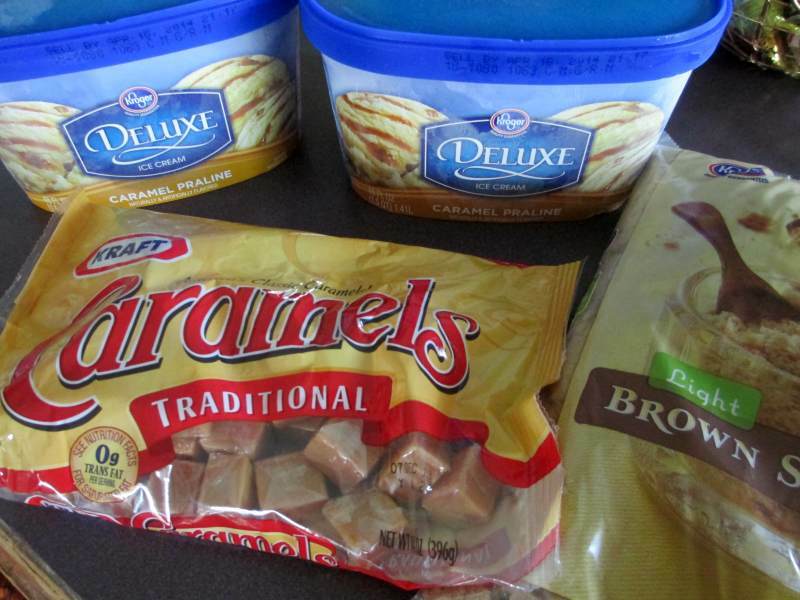 This is a no-nonsense celebration recipe for when you deserve a sweet treat! My nana used to make this pie every year for my Grandpa Bill’s birthday. Combine the cream cheese, peanut butter, and powdered sugar in a large bowl. Beat with electric mixer until creamy. Fold in the container of whipped topping. Spoon the mixture into the piecrust. Cover with parchment paper and place in the fridge for a couple of hours to chill. Drizzle chocolate syrup or sprinkle shavings on top if desired. See Kitchenability 101 for more information. This cookbook is filled with quick, easy, fun, and inexpensive recipes – who could ask for more?! The following Cream Puffs Recipe is a family tradition. 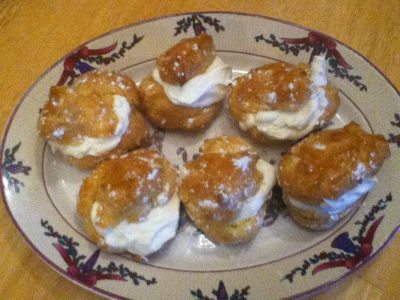 I’ve made these DELICIOUS cream puffs for Thanksgiving breakfast since 2001. I call them my “Thanksgiving Parade Pastries” because I make them while watching televised Thanksgiving parades. Needless to say, they’re just as delicious and will disappear just as quickly on Christmas or any other day. I got the recipe years and year and years ago from an issue of Taste of Home. I have no unearthly idea which issue it was in because I’ve always cut my favorite recipes out and saved them in one of my “Favorite Recipes” scrapbooks. I can tell you this, though: This is a recipe I wouldn’t take anything for. These cream puffs are spectacular and the recipe refuses to fail. Ever. In a saucepan, over medium heat, bring water and butter to a boil. Add flour and salt all at once; stir until a smooth ball forms. Remove from the heat; let stand for 5 minutes. Add eggs, one at a time, beating well after each addition. Beat until smooth. Drop by 1/4 cupfuls 3 inches apart onto greased baking sheets. Combine milk and egg yolk; brush over puffs. Bake at 400 degrees for 35 minutes or until golden brown. Remove to wire racks. Immediately cut a slit in each for steam to escape; cool. 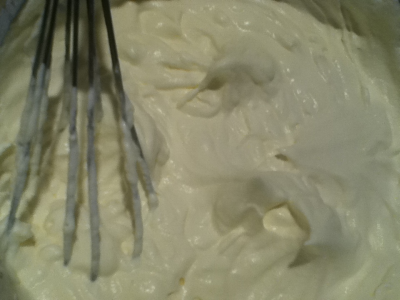 In a mixing bowl, whip cream until soft peaks form. Gradually add sugar and vanilla, beating until almost stiff. Split puffs; remove soft dough. Add filling; replace tops. Dust with confectioner’s sugar. Refrigerate until serving. You may want to double the recipe for the filling…. 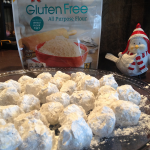 Here’s a fast and easy Christmas/Holiday (or anytime!) dessert recipe that’s simple to whip up, but looks and tastes like you labored for days. This is from a wonderful cookbook, Pillsbury Christmas 2011 . I collect Christmas cookbooks (as well as ALL cookbooks!) and this is my newest addition. Funny thing about great Christmas and holiday cookbooks, they can be used all-year long. Mine are never stored away – I honestly use them throughout the year. This particular Christmas cookbook is one of the best. The recipe below is just one of the countless outstanding recipes inside. Heat oven to 450 degrees. 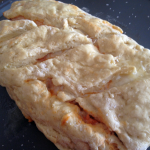 Remove1 crust from pouch; unroll on work surface. Roll lightly with rolling pin. Cut 12 rounds from crust with 2-1/2 to 2-3/4 inch cookie cutter. Press rounds in bottom and up sides of 12 mini muffin cups, with edges extending above cups about 1/8 inch. Repeat with remaining pie crust. Place about 5 of the chocolate chips in each crust. Bake 6 minutes. Leave crusts in pan. Reduce oven temperature to 375 degrees. Meanwhile, in medium bowl, beat cream cheese, brown sugar, caramel topping, and egg with electric mixer on medium speed until creamy. Spoon evenly over chocolate chips, about 1-1/2 teaspoons for each tartlet. Bake at 375 degrees for 10 to 12 minutes or until cheesecake is set. Cool in pan on cooling rack 10 minutes; remove from pan. In a small custard cup or other small microwavable bowl, place remaining chocolate chips and the oil. Microwave uncovered on High 30 seconds; stir. Microwave about 30 seconds longer or until melted; stir. 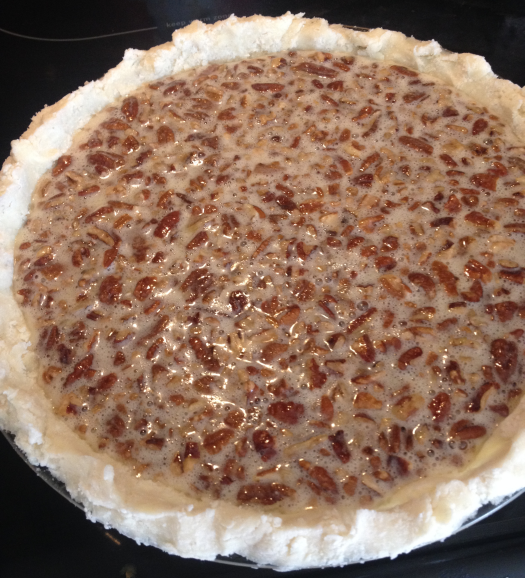 Drizzle over each cheesecake; immediately sprinkle with pecans. Refrigerate at least 2 hours before serving. Cover and refrigerate any remaining tartlets. 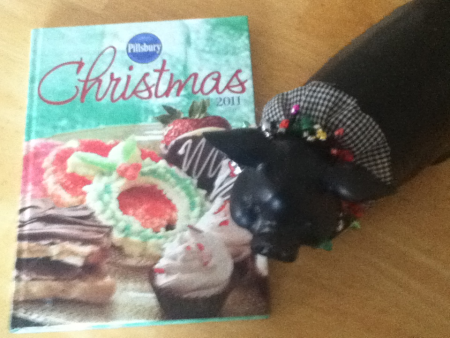 Take a closer look at Pillsbury Christmas 2011 by clicking the link. This one’s outstanding. The lady in the art print above is a girl after my own heart. The look of ecstasy on her face reminds me of myself when I’m that close to a great pie. Click through for a closer look at the art print and check out the pie recipes on the food blog!